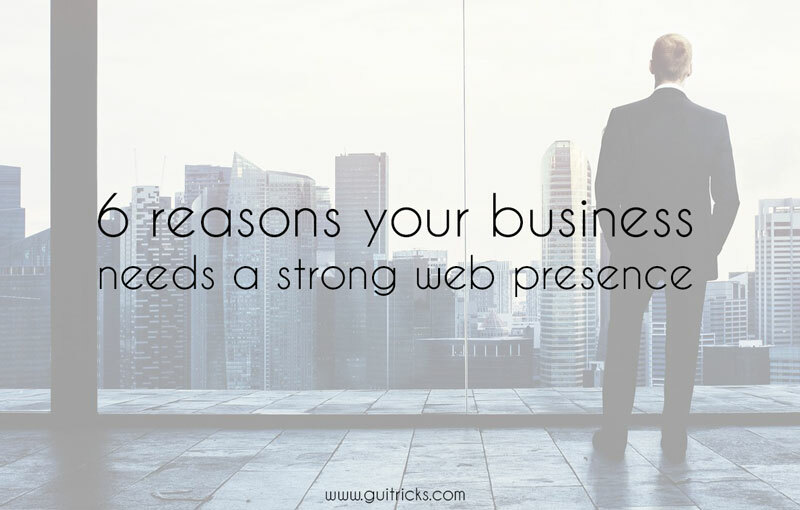 6 Reasons Your Business Needs A Strong Web Presence | GUI Tricks - In Touch With Tomorrow! 6 Reasons Your Business Needs A Strong Web Presence - GUI Tricks - In Touch With Tomorrow! Today, having a strong presence online is a must, because that is where most of your potential customers are. Studies have shown that 97% of consumers look up local businesses to shop on the internet.So, in order to truly have a good marketing strategy and empower your brand, you need to take over online outlets that are at your disposal. Ignoring the online aspect of your marketing and sales is close to you not existing at all. Being present online benefits you in many ways. So, here are 6 reasons why your business needs a strong web presence, be it via your website or social media. Your website is one of the essential tools for brand building. In other words, via your website, you can earn your customer’s trust in your business or product. This way you can easily and successfully convey the message why your customers should trust you, and back it up with proof, such as customer testimonials and reviews. It is a fact that most people will look you up online before they buy from you, because they need to know how credible you are. By posting quality content and interacting with people via your website, you will build a relationship of trust, and your sales will increase. You should know that people prefer buying to being sold to. The difference between selling your product in person and online is that your customers feel much more relaxed when they visit your website, while also easily finding information on what they are looking for. When you market your product online, you have a far greater reach than with traditional marketing. You don’t have to worry about details such as printing materials and how much mailing costs. Rather, you can let your website do the job for you, with much more cost-effective distribution. Your website can be used as an interactive tool to help you learn more about what your customers want, and let them know how they can get it. In order for your customer to be able to reach out to you 24 hours a day, you can implement a simple online contact form which they can use to contact you and ask whatever they need to. A list of frequently asked questions on your website is a great way to convey necessary information and feedback as well. You can host surveys and questionnaires to automatically generate data about your customers’ needs. If your customers are unaware of a product or service, you can write a blog about it and educate them. Being present on social media sites is a must, because it’s the best way to drive targeted traffic and get posts about your website, blog, products and services shared far and wide. By driving traffic to your website this way, you are making search engine crawlers aware of the pages that are gaining the most traffic, and therefore helping them rank higher on SERPs.While writing high-quality content and implementing it into a good content strategy is essential for your SEO efforts, using social media to drive traffic to your optimized pages is one of the best ways to get high rankings. What makes social media marketing so great is the level of interaction that you can have with your customers. You get to read their posts and get insights into their habits so that you can improve your marketing strategy along the way. Next to your customers, you can also connect with non-competing businesses and thought leaders in order to learn new things about your industry, share ideas and experiences and further improve your own business, or even partner up. Furthermore, social media can help you get your presence noticed on events, and you can earn media coverage. If you engage with customers on various social networks, you get the chance to gain followers the same way that your competition does. While different businesses have different budgets, social media marketing pretty much gives everyone an equal footing. If you come up with the most clever and creative tactics to grab your customers’ attention, and post high quality, valuable content, you’ll gather a great audience. Basically, social media marketing is a game of outwitting and outwitting your competition, while providing your customers with better products and service. Without a strong web presence, your business is bound to be swallowed by competition and become almost invisible to your potential customers.By having a great website and being present on various social media sites, you get the chance to interact and build relationships with your customers and peers, increase sales and easily market your products, as well as drive targeted traffic and boost your SEO efforts.Therefore, using a web presence to your advantage is a necessity today. Steven Clarke is a digital marketing specialist and a small business web design consultant. In his spare time, he likes to write about his ideas and share them with the world. Steven is a regular contributor to several websites.